The color isn't an exact match, but I think the shapes are very similar. The Halogen version is available in a whole host of colors, so make sure to check the rest out. 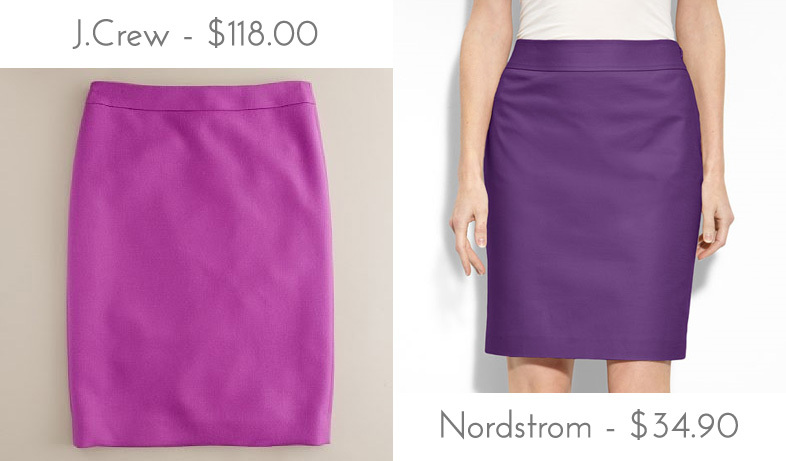 The skirt is currently marked down for the Nordstrom anniversary sale (which goes until August 1). Make sure to check out all the sale items, because the discounts are deep. What do you think? Is this something you would wear? Have you checked out the Nordstrom sale? I may have snagged this very expensive bag for myself. I love the color, and I love pencil skirts, but I would like this one better if it were a bit longer. I always feel like pencil skirts should fall below the knee, but maybe that's just me. So hilarious that Nordstrom is the cheaper option! It kind of gives me perspective that just because a store is typically expensive, doesn't mean I can't find good deals there, too!! i got this skirt in the mustard color and love it - the bag you picked up is beautiful!